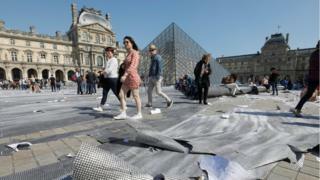 A huge paper collage created to mark the 30th anniversary of the Louvre's glass pyramid has been ripped to shreds by visitors within just a few hours. 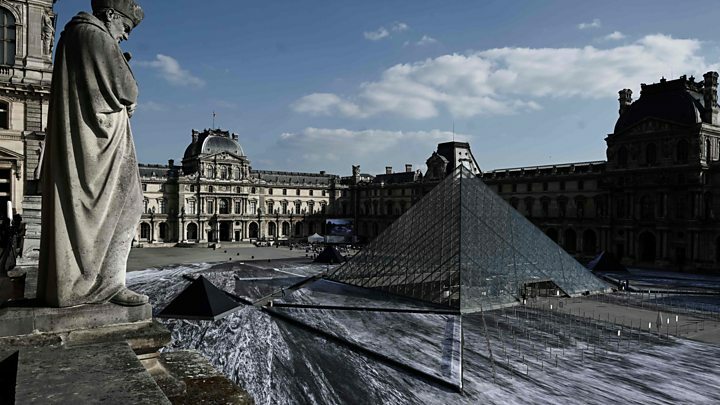 French artist JR and 400 volunteers laid 2,000 sheets of paper in the Paris art gallery's courtyard on Friday, making the pyramid appear to extend down into a quarry of white rock. But on Saturday, it was soon torn apart by visitors walking over it. "The images, like life, are ephemeral," a philosophical JR tweeted. "Once pasted, the art piece lives on its own," he said of the 17,000 sq m (183,000 sq ft) work. However, the impermanence of the collage split opinion among art lovers. One described it on Twitter as a "really disappointing bad experience today for the Louvre pyramid's 30th anniversary". Another dryly noted that "JR's art piece was more fleeting than foreseen". In response, JR, whose real name is James Rene, went on to interpret the collage as a piece of performance art. "The sun dries the light glue and with every step, people tear pieces of the fragile paper," he said. "The process is all about participation of volunteers, visitors, and souvenir hunters." It is not the first time JR has taken over Paris' famous art institution. Three years ago, he gave the pyramid a very different treatment, covering it in a giant trompe-l'oeil that made it seem like it had disappeared.